stih.su - Poems of Russian poets - Read the poems of the poets of the classics and modernists. One of the largest sites in Russian dedicated to poetry. Here the authors can lay out their verses, receive ratings and reviews. Here, modern poets can publish poems, and poetry lovers - read both their works and the poems of the classics. Authors and readers here can communicate with each other. Poetic contests are held, other events are arranged - the site lives a stormy life! Read a poetic magazine, look through poetry ratings, enter poetic dueling - or just watch them. Poebuk will offer something interesting to anyone, who are keen on poetry. For you - poetry poets of the Silver or the Golden Age and ample opportunities to show the world their own works. All works published on this server were transferred to the public domain. The term of copyright protection for them has ended and now they can be freely copied on Internet. The goal is to give all authors the opportunity to publish their works on Internet and find readers. All copyrights to works are assigned to authors on the basis of a user agreement. Find out what a famous writer is writing like you. The site has a form field, we can type some text and find out what style of famous writer we write. Enter the name of the author and you will be shown other similar style. The site for the publication of works by experienced and novice authors, and also provides an opportunity for the reader to express his opinion about the work in the comments or in a critical article. The project is open to writers from different regions and countries who speak Russian. The goal is to unite people who create new generation literature and those who want to read and discuss it, as well as those interested in music, cinema and other arts. LitKult regularly hold literary meetings with literary contests and reading poems, prose in different cities. Reports on meetings are published on the site. There is a forum. The connoisseurs of the cinema and everyone who cares about it can get acquainted with the already published reviews about films (classics of cinema and modern paintings) in the section Reviews of films. The goal is to help young authors find their readers, and readers - to heart and heart and mind. The authors are given the opportunity to get a personal page in our literary magazine and publish their works on the Internet: poetry, prose, journalism, criticism, scientific articles on humanitarian topics, as well as reproductions of pictorial and graphic works. The volume and number of works are unlimited. Authors of periodical literary criticism, publicists and editors are invited to cooperate. Authors can receive royalties for their publications. The site of modern literature. For free publication by authors of their works. Here you can read free online books of contemporary authors and evaluate their creativity. Authors are registered and in the personal office you can post works, manage them and, if you have the talent, get fame. More than 2,300 authors have been registered and over 19 thousand poems have been published. Interactive poetic magazine with a free publication - registered authors can independently post on their magazine pages their poems, write and receive feedback on poetry. In addition to the electronic edition of poetic works, the literary network provides registered authors with other rights that allow them to participate in the life of the site and the formation of its editorial policy. These rights include: announcing poems, writing content reviews, organizing poetic competitions, inviting new authors (content creation), participating in the promotion of your page and the entire site on the Internet. The level of rights of each author is regulated by the scoring system, which combines automatic accounting of the user's activity, rating of his poems and manual moderation, allowing the team of editors to pursue a certain policy. Participation in poetry contests, the announcing of poems, the invitation of new authors, the placement of external links to poetry and the author's page, the placement and removal of poetry, the receipt and writing of reviews on verses, are all included in the scoring system that determines the rating of the authors of the site and a rating of poems. All rights to the verses placed on the site belong to the authors, reproduction of poems, affecting the rights of authors, is possible only with their permission. When quoting verses in the legally permitted framework, a reference to the source is required. On the site you can publish poetry and prose, place audio and video files. There is a section with reviews, chat and forum. Each poem has a count of views and comments. Registration on the site is required. Here you can publish your poem and get a backlash from the same novice (or non-novice) poets. All the poems are edited. At the moment there are 700 authors who wrote more than 65 000 poems of works. It is allowed to publish any works, discuss any topics directly or indirectly related to literary creation, except for those prohibited by law. Dissent is not pursued. Suppressed attempts to insult opponents and their beliefs in any form. The site contains quotes, or rather pearls. Pretty decent base - thousands of pearls, divided into categories. Here cited famous, famous and obscure statements of famous people. But you can also share a wise saying. Perhaps you will agree and consider your saying wise. Music + text + picture, it is together the three components can most accurately and vividly express your emotions. Even if you can not draw, write poetry, write music. Literary portal specializing in fan fiction. The site selects only the best works and provides readers with a convenient interface for reading and discussing them. 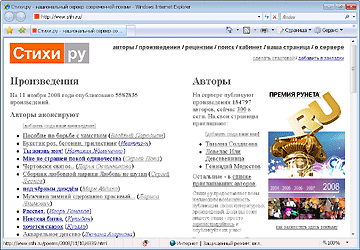 The site was created during the craze of Russian youth by Harry Potter, when the Internet was full of fan sites, forums, role-playing games, online schools of magic and similar projects. Fan-fiction pre-moderation - each work prior to publication is tested by the editor, who can point the author to an excessive amount of errors in the text, problems with the design of punctuation marks and the lack of meaning in the text. Therefore, any work on our website is distinguished by literacy and coherent narration. Convenient search - search for fan fiction/originals by any parameters of the header in any combination; search by author name; search by name; ratings on views, comments, readers, recommendations; popular today, yesterday or last week. We can look for a dozen different ways and be sure to find what you need. Encyclopedias of fandoms - it happened that you read fan fiction by someone’s recommendation, but by an unfamiliar fandom, and did not know where to look for information on this fandom ... For each fandom all canons are listed, all characters are listed with short and detailed descriptions and even with portraits, and more useful links. Audio versions - many people like to listen, not read. There are audio versions of fanfic that can be heard directly on the site or downloaded as MP3 files. Subscriptions, tags, bookmarks, collections - you can not only read one fan fiction, but also keep track of everything you read or what you are planning to read. And with the help of the fan fiction to file service, you can even keep track of works published on other sites. Blogs - you can share with someone what great fan fiction you have read, what movie you watched, what grade in literature you got. Contests - fan fiction contests are regularly held on various topics, participate, read, vote, call friends, win. Fanfic - a story in which the author describes the events taking place in a world coined by someone else. These are popular films, books, series and so on. The author simply takes the famous characters and comes up with his story with them. Lyrics How rich was Pushkin?